Yamaha PSR E253 Review - Is this keyboard any good? 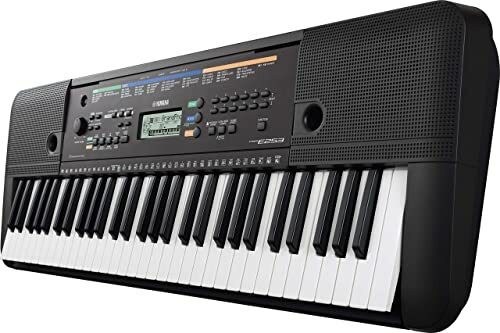 Today, we’ll be reviewing the Yamaha PSR E253. We’ve taken a close look at the ins and outs of this keyboard to find out if it’s the right choice for you. We’ve analyzed every aspect of the piano that might be relevant to musicians at every skill level. We’ll find out about the things that this piano does well, and the things that it doesn’t. The biggest selling point of this piano is definitely going to be the price. Yamaha is known for making excellent products that often have very high price tags. But, that’s not the case here. The PSR E253 is about as affordable as you could ever expect a keyboard to be. Now, understandably, you do face some problems when buying anything on the cheap. We’ll cover them later. For now, bear in mind that you aren’t getting a keyboard that comes with loads of bells and whistles. Understandably, the keys lack many of the features that come with higher-end units. However, they do benefit from one important piece of technology – Touch sensitivity. Touch sensitivity refers to a keyboard’s ability to register the difference between a soft and a hard note. On an acoustic piano, the feature is a natural component of the instrument. But, on an electric keyboard, it is something that has to be created. Virtually every high-end keyboard includes this feature. In fact, it is considered so basic, that they might not even list it as a feature. However, when you get into the price territory that we are looking at it is never a given. That being the case, it is nice to see that it is a feature of this keyboard. You also get lots of different voices with the PSR E253. Voices, for the uninitiated reader, refer not to human sounds, but to different tones that the piano can produce. You get 253 here. They range from a wide variety of different instruments to multiple kinds of pianos. It is also worth mentioning that the E253 is very easy to move around. The dimensions of this unit are such that it can be played on a desk or table without any issue. However, if your playing space is also used for other tasks, you may find yourself needing to move it quite often. Thanks to its compact dimensions, and a low weight of only ten pounds, that won’t be a problem. This is a basic unit made for beginners that don’t demand the same level of quality that experienced players do. And you don’t get a low price tag without making a few concessions. The biggest problem is that the keyboard is radically undersized. A standard piano has eighty-eight keys. As a beginner, you will only use a very small portion of them. However, as your skills improve, you will move on to other regions of the instrument. Skilled players are definitely going to want a full-sized keyboard. Unfortunately, you don’t get that here. 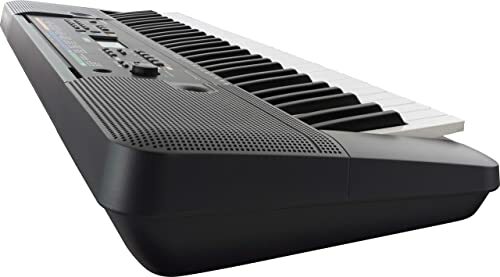 The PSR E253 includes only sixty-one keys, which you may outgrow in a relatively short period. To make matters worse, the keys also are not weighted. This means that you will not experience much resistance when you push down on them. The touch sensitivity is the only saving grace when it comes to the keyboard. Then there are just general issues that come with the territory of buying a cheap piano. There is no stand, and you don’t get any pedals either. This is a bare-bones piano. The beginner benefits from a low price-tag that allows them to experiment with a piano without much financial risk. The unfortunate thing is that, if you find yourself enjoying the instrument, there is a dilemma. Eventually, and probably fairly soon, you will need to upgrade. We have nearly concluded our review. You have seen what the Yamaha PSR E253 does well, and what it struggles with. Time for some final thoughts. As you can see, the PSR E253 has plenty of positives. But, let’s not kid ourselves. This is a very basic piano. In fact, this is about as basic as Yamaha gets with any of their products. Still, there is a large market for basic keyboards. If you are just starting out, it makes sense to start with a small investment. If you want an affordable piano that packs a punch, this is a great option to consider.